Use our various workshops, circle time suggestions, and early science activities to teach your group all about butterflies! (Open poster-Butterfly metamorphosis) This special tool was created in response to a special request received. Print and display. Use it to show children how a caterpillar becomes a butterfly. Purchase a butterfly hairpin and wear it to attract children's attention. Throughout the week, teach children butterfly facts and make pretty butterfly crafts with them. Use white or light yellow modeling dough to make tiny butterfly eggs with your group. Glue 3 green pompoms on a wooden clothespin. Add wiggly eyes. Glue pieces of green, white, and brown tissue paper on an empty toilet paper roll. Top with a layer of "Mod Podge" or diluted white glue. Cut a coffee filter to make it look like a butterfly. Color it with markers. Spray a small amount of water on it to dilute the colors. Attach a pipe cleaner in the center. Invite children to explain, in their own way, how a butterfly is born. They may use their crafts to complete their explanation. 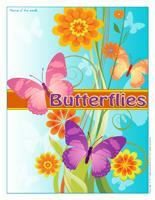 (Open Thematic poster - Butterflies) Print, laminate, and decorate the walls of your daycare with all kinds of posters. 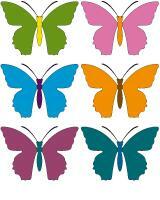 (Open educa-decorate-Butterflies) Print, cut out, and laminate. Use the illustrations to decorate your walls throughout the theme. Hang colourful butterflies from the ceiling. You may purchase some at the dollar store. Hang your parachute over your table. Often parachutes are bright and colourful, just like butterflies. (Open leaf garland) Use the leaf shapes to create a garland. Hang it within your daycare. Have children create tiny insects and add them to the garland. Hang a piece of tulle from the ceiling and deposit butterflies on top. Use butterflies purchased at the dollar store or butterflies made by the children in your group. The pictures may be used as a memory game or to spark a conversation with your group. Use them to decorate the daycare or a specific thematic corner. 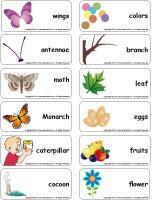 (Open picture game-Butterflies) Print, laminate, and store in a Ziploc bag or in your thematic bin. The stationery may be used to communicate with parents, in your reading and writing area, or to identify your thematic bins. (Open stationery-Butterflies) Print. 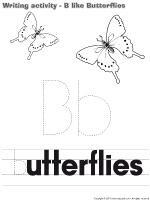 (Open writing activities-B like Butterfly) Print for each child or laminate for use with a dry-erase marker. 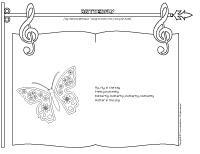 (Open activity sheets-Butterflies) Print and follow instructions. (Open color by number-Butterfly) Print. Children must color the picture according to the color code. 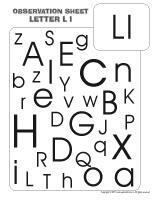 (Open observation sheet-The letter L) Print for each child or laminate for use with a dry-erase marker. Green straw (like the one found in Easter baskets) in a shallow container. Add plastic insects. Children will enjoy making them crawl in the "grass". Offer only green, black, brown, and red blocks. Invite children to create giant insects. Assembly games such as K-Nex or Magnetix will offer children the opportunity to imagine a wide range of silly or scary insects. Create a beekeeper corner. Include a hat with a net, a rain suit, a few bees (or other insects), a large square box (to represent a bee hive), and a few instruments such as a watering can, a shovel, etc. (Open sequential story-Insects) Print and laminate. Children must place the illustrations in the correct order to recreate the story. 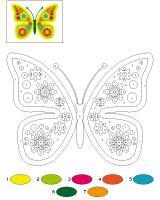 (Open model giant butterfly) Print the model and offer different items babies can use to color the butterfly. You may provide chocolate, vanilla, or lemon-flavoured pudding, strawberry-flavoured Jell-O, etc. (Open mobile-Butterflies) Print, cut out, and laminate. Assemble the butterflies to create a mobile. Hang the mobile over your changing table. Paint babies' hands with poster paint and help them print them side by side to create butterfly wings. Draw a body and add eyes and antennae. Display the butterflies on the walls of your daycare. Children stand in line and hold the child standing in front of them around the waist. They move about, to the sound of music. The first child decides how the caterpillar moves. He can move forward, backwards, turn, take tiny steps, giant steps, etc. Children stand on a line. When you give them the signal, the race begins. They must fly (moving their arms) across the room. The winner is the first child who crosses the finish line. 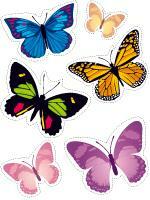 (Open butterfly race) Print, cut out, and laminate the pieces. Stick all the flowers on the walls. Divide your group into two or three teams. Give each player a butterfly. Children must stick their butterfly on the corresponding flower as quickly as possible. This is a calm activity which is perfect right before naptime. Children curl up in a ball and pretend they are in a cocoon. Gently, they begin to stretch to break their cocoon. They stretch even more, making wave-like motions with their body to represent a caterpillar. Finally, they flap their arms to represent their butterfly wings. Use your parachute. Deposit pieces of crumpled tissue paper in the centre to represent butterflies. Shake the parachute to make the butterflies fly about. Provide a blanket. Each child holds one corner. Deposit a ball or a cushion on top to represent a butterfly. Children shake the blanket to make the "butterfly" move. The ants: Children stand on a line. When you give the signal, they crawl towards the finish line. The butterflies: Children stand on a line. When you give the signal, children pretend to fly towards the finish line (flapping their arms). The worms: Children lie on the ground. When you give the signal, they must crawl and slither towards the finish line. The caterpillar: Divide your group into two teams. They stand in line, holding the child in front of them by the shoulders. When you give the signal, children must walk towards the finish line in unison. Hide tiny butterflies throughout the yard. 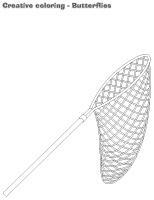 Invite children to "catch" them using butterfly nets. Provide magnifying glasses and containers. Invite children to explore the yard and search for butterflies and tiny bugs. Ask around...you may be lucky enough to find someone who knows a butterfly collector. Hang a large white banner near your daycare entrance. Invite children to draw butterflies on it with their parents. (Open dominoes-Insects) Print, glue on heavy cardboard, and laminate. This game is for two to four players. Each child picks five cards. Place the remaining cards in a stack on the table. Turn over one card. The first player tries to deposit one of his cards which must match an illustration already on the table. Matching illustrations must be touching. The second player does the same, and so on. If a player does not have a card with a matching illustration, he must pick an additional card from the stack. If he is still unable to play, his turn is over. The game ends when a player has used all his cards. 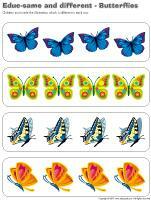 (Open educ-math-Butterflies) Print and laminate for durable, eco-friendly use. Children must count the objects in each rectangle and circle the corresponding number. 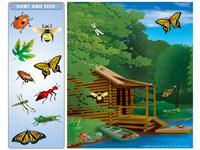 (Open educ-same and different-Butterflies) Print and laminate for durable, eco-friendly use. Children must circle the illustration which is different in each row. Give each child an empty toilet paper roll they can decorate to represent a cocoon. Draw a tiny butterfly and stick it to the end of a Popsicle stick. Children can use the items to explain how a butterfly comes out of a cocoon by sliding the butterfly in and out of the tube. Make bracelets which represent a butterfly's life cycle. Give each child a pipe cleaner. Have children place the following items on their pipe cleaner : a white bead (to represent the egg, a flower-shaped bead (as a divider), four green beads (to represent the caterpillar), another flower, a beige or gold bead (to represent the cocoon), another flower, and finally a butterfly-shaped bead. Children will proudly use their bracelet to explain the butterfly's life cycle to their parents. Each child finds a partner. Children take turns wrapping each other with toilet paper to represent the caterpillar in its cocoon. Make a giant butterfly and display it on the wall. Let children decorate it with a variety of materials. Encourage children to look at books for inspiration and then let them draw their favourite butterfly. When they are done, they may present their drawing to the group. Deposit a plate or bird bath in one corner of the yard. Add water and a few citrus slices along with other small fruit pieces. A few flower petals can also be left out to attract butterflies. Catch butterflies or caterpillars and keep them in transparent containers. Be sure to make holes in the lids! Children will love caring for them and observing them! Divide a paper plate into four sections. These four sections shall explain the life cycle of the butterfly. In the first section, ask children to glue rice to represent the eggs. In the second section, have children glue fusilli pasta pieces to represent caterpillars. In the third section, children can glue shell-shaped pasta to represent cocoons. Finally, in the fourth section, have them glue bow-tie pasta to represent butterflies! For a touch of color, dye your pasta pieces beforehand. Use a wooden stick and string to demonstrate how a cocoon is made. Simply wrap the string around the stick several times...until it looks like a cocoon. Place a salad leaf in a plate. Place three melon balls in a row to represent a caterpillar. Add raisins for the eyes. Cut a slice of bread in two diagonally to create two triangles. These will become your butterfly's wings. Place a carrot in the centre to represent its body. Spread jam or cream cheese on the bread and add two liquorice pieces for the antennae! Variation: Add food coloring to milk and gently paint the bread with the milk before toasting it in a toaster or in a pan... children will love the colourful wings! Prepare your favourite cake recipe and bake it in a round pan. Cut the cake in two and place the two half-circles side by side to create a butterfly shape. Use marshmallows or colourful icing to make the butterfly's body. Add liquorice for the antennae. Decorate with your group. Trace a giant butterfly shape on cardboard and ask children to cover it with colourful tissue paper. When they are done, spray water on it until it is very wet. Gently remove the tissue paper pieces. They will have deposited color on your giant butterfly. Give each child two pieces of construction paper. Show them how to fold them accordion-style (like to make a fan). Cut a butterfly body out of heavy construction paper and glue the two fans on either side. Add eyes and antennae. (Open models-butterflies black and white) Print for each child. Have them cut out the butterfly and fold it in the centre so they have two equal parts. They can then add poster paint on one side before folding and pressing firmly. Next, they can gently open it up to see the colourful result. Variation: You may also make a giant butterfly the same way by tracing a butterfly shape on a large piece of cardboard. Fill a sandwich bag with scraps of colourful paper. Attach it in the center with a pipe cleaner to create a beautiful butterfly! 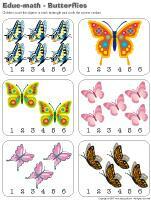 (Open mobile-Butterflies) Print and have children decorate the butterflies. Assemble them as a mobile by tying them to a hanger or other support. Cut an egg carton so that two sections remain attached together. Make a hole in the bottom of each section. Attach pipe cleaners on either side to make glasses. Children can decorate their insect eyes. (Open models-Circles) Print and cut the models of your choice out of construction paper. Cut out the circles and glue them on another piece of paper, overlapping them. Add wiggly eyes and antennae. Make caterpillars simply by lining up colourful pompoms and gluing them together. Use a row of six egg carton sections to make a caterpillar. Simply paint and decorate. Give each child one cone-shaped coffee filter. Open it to create two butterfly wings. Provide several containers filled with water and food coloring (different colors) along with eyedroppers. Children use the eyedroppers to drop colourful water on the coffee filter. Let dry. You will have a beautiful pastel-coloured butterfly. Cut a potato in two and dip it in poster paint. Children make prints, side by side, on a large sheet of paper. Next, they dip their index finger in black paint to create antennae and to add spots on their butterfly. 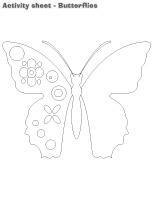 (Open creative coloring-Butterflies) Print for each child. Encourage children to draw colourful butterflies in the net. 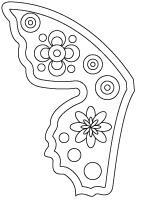 (Open coloring pages theme-Butterflies) Print for each child.